John Hunter, a Scottish surgeon, was born Feb. 13, 1728. John was the younger brother of William Hunter, another prominent surgeon of the period; John was surgeon at St. George’s Hospital in London, and a pioneer of a number of surgical techniques. But he was also a collector, mostly of objects that can help teach anatomy, human and animal. He installed thousands of specimens in a museum at his home in Leicester Square. His most famous display item was certainly the skeleton of Charles Byrne, a 7′ 7″ tall human oddity known as the “Irish Giant.” Byrne rose to notoriety in London in the 1780s and then as quickly died of dissipation; wary of posthumous fame, he had given instructions that he be secretly buried at sea. But Hunter paid Byrne’s executors the extraordinary sum of £500 to forget their obligations and surrender the corpse to Hunter, which he then prepared, mounted, and put on display. After Hunter died in 1793, the British government was persuaded to buy the collection, which they then turned over to the Royal College of Surgeons in London. 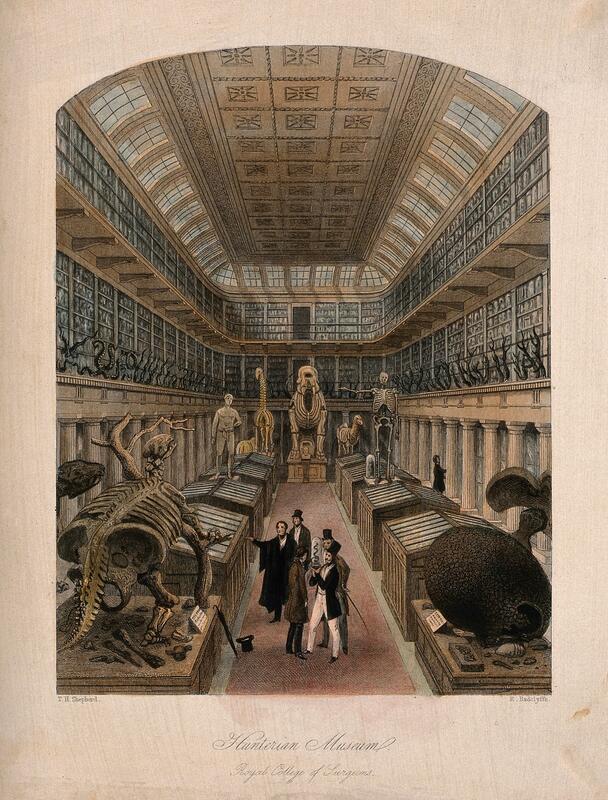 The Museum grew and grew in the 19th century, presided over by notable anatomists such as Richard Owen; we see here an engraving showing the Museum in its heyday (first image). But the building was badly bombed in 1941 and much of the collection was destroyed; a mastodon jaw and tooth shows the effects of the resulting fire (second image). The Hunterian Museum was rebuilt after the War, and enough of the specimens survived to make an impressive display even today (third image). The skeleton of the Irish Giant still looms over everything, except the bust of Hunter above it. There is an oil portrait of Hunter at the National Portrait Gallery, a copy of a deteriorating original by Sir Joshua Reynolds (fourth image). And there is a statue of Hunter in the Oxford University Museum of Natural History. The Museum has a number of statues of important scientists on display around the main court; you enter between statues of Aristotle and Francis Bacon, and if you turn left, there, right next to Aristotle, is John Hunter, and beyond stand Thomas Sydenham, William Harvey, and Hippocrates – a more eminent company of physicians would be hard to find (fifth image; Hunter is second from left). It should be noted that there is another Hunterian Museum in Glasgow, which contains the collections of brother William. Both are magnificent museums, but they should not be confused.